Lovely, we get amazing swarms of dragonflies sometimes. I haven’t seen one like yours. Oh, I bet you do see a lot. We saw a dragonfly migration on the beach at Sanibel one year that was just amazing. We do and they are maddening to try and photograph. Oh my goodness: That is so beautiful! 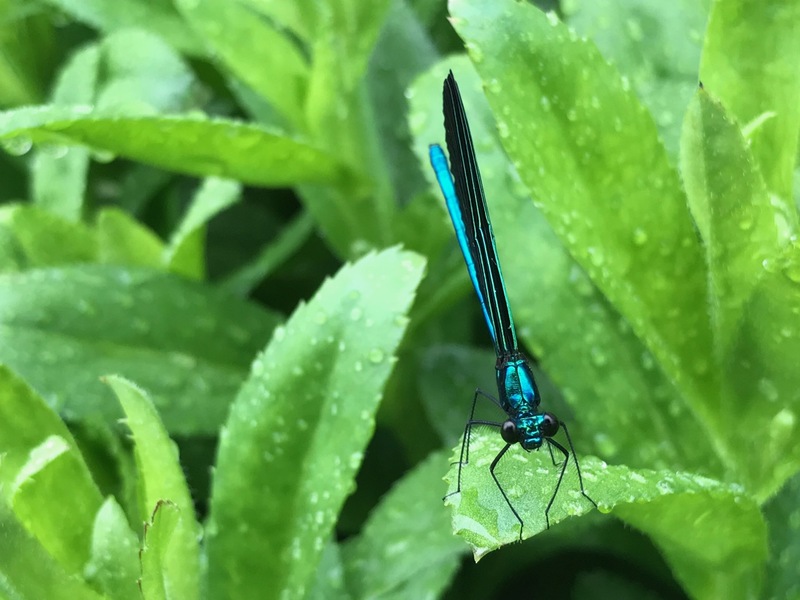 Your images and the video are excellent quality, so we really get to see the fine details of this beautiful damselfly. Thank you for sharing! Thank you Beth. It was a treat to see this exquisite creature. Such a beautiful insect! Dazzling! That metallic blue is pretty alluring. So pretty! I wonder what evolutionary advantage that fabulous blue color offers. The electric blue surely gets him notice. I was glad to get a photo of this little guy. We saw one of these at last year’s fling that started to write about but I never finished. I love that colour and shine! Thank you for capturing this. 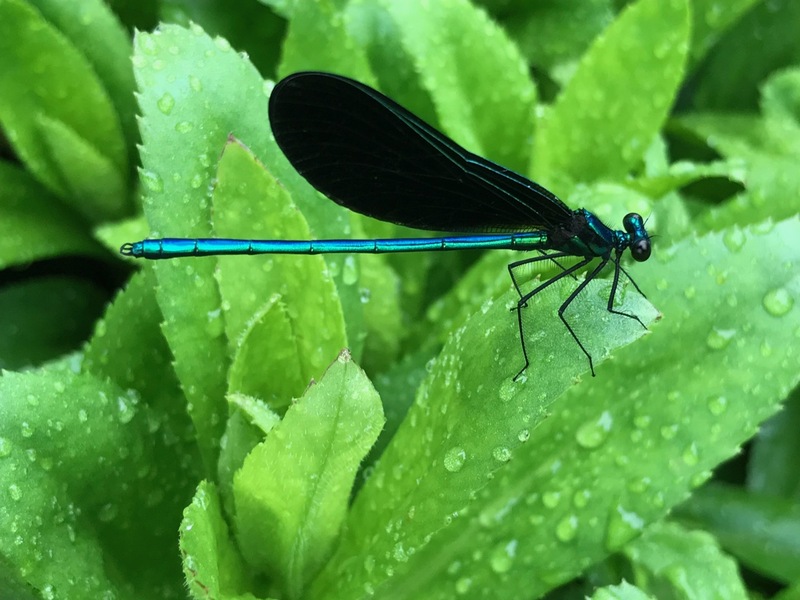 I always stop what I am doing if a dragonfly or damselfly pops by. They are very special. I do the same Ali—can’t help but pause and admire them. What a beautiful colour. Well-captured! I saw a flash of blue near a brook yesterday, and it was no doubt something similar. Thanks for sharing! We’ve had so much rain lately this little guy may have thought he was near a brook. Congratulations on your wonderful photos of this magnificent creature, such an amzing colour! Thanks Pauline. 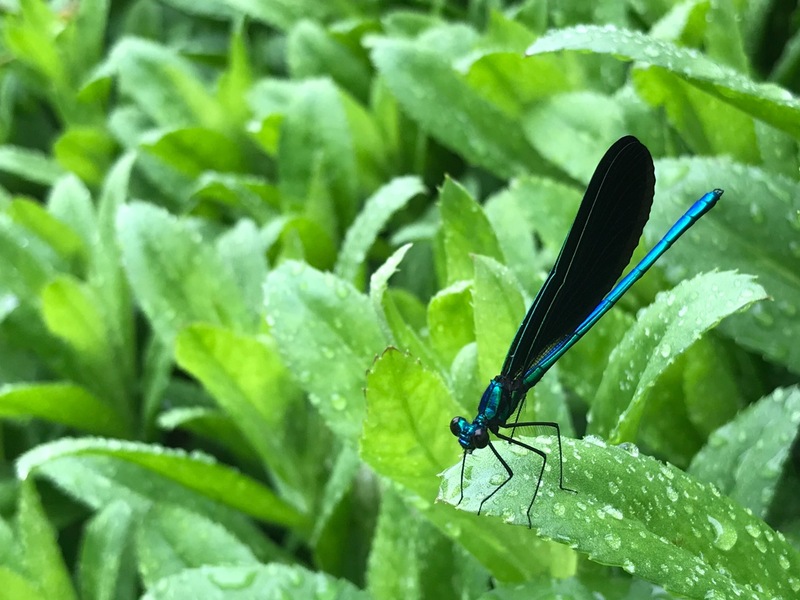 The danselfly was a patient model. A lovely moment in the garden. Oh, excellent capture! I’ve never seen one of those – wonder if we have them around here. Wikipedia says eastern two thirds of US so it’s likely. Was very pretty blue. Well done great shots of a stunning insect. Thank you Christina. It’s funny we can be just in the right spot for a certain moment in time. Haven’t seen this insect since, although I am starting to see butterflies and other interesting creatures.